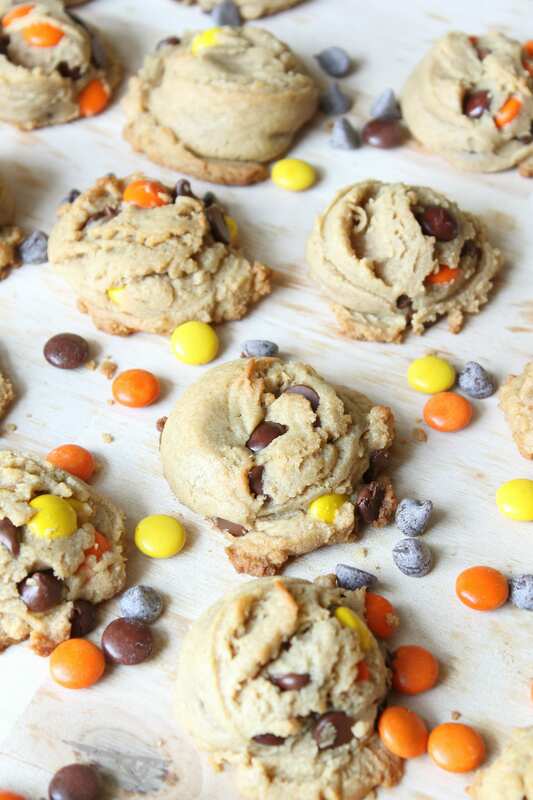 Reese’s Pieces Peanut Butter Cookies – Soft and dense peanut butter cookies, with chocolate chips and Reese’s pieces candy. 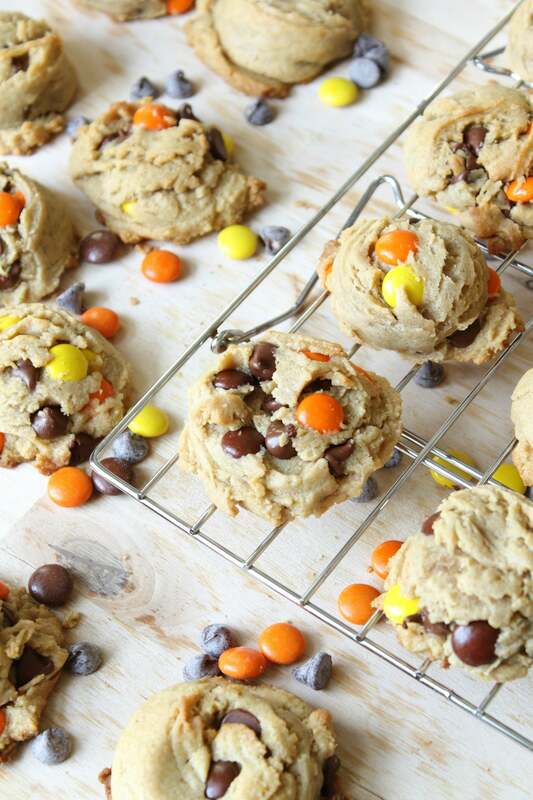 A chewy cookie that kids and adults will both love! I’ve always had a weakness for peanut butter and chocolate together. Whether it’s peanut butter cups, buckeyes, ice cream, or pie, my sweet tooth yearns for anything that combines these two glorious flavors together. There was a time(s) that I was so desperate for something sweet that I took a handful of chocolate chips and a scoop of peanut butter, melted them together in the microwave, and ate it with a spoon. And I am not ashamed one little bit for admitting that. A girl’s gotta have her sweets, okay! In fact, I think I am quite the genius of coming up with it, thankyouverymuch! And I must say, these cookies taste just as delicious as they look. The best part about these cookies is the texture: they are soft and moist and gooey, all at once. I personally like a soft cookie with a slight crispiness around the edge; a cookie that taste great hours/days after baking. And these deliver on all the above. The saltiness of the peanut butter is just the right amount to balance the sweetness of the candy and chocolate. Ugh, here I go talking about balanced flavors again. But it’s soooooo important! If you have something that’s too salty or too sweet, you may eat it but you probably won’t feel any particular way about. I’m telling you, when you have something that perfectly balanced between the two, you won’t want to put it down. And that is exactly how I feel about these cookies. Most cookies turn out best when you chill the dough before baking. And these cookies are no exception. See, when you soften the butter for the dough, you need to firm it back up, otherwise your cookies are going to spread out too much. And then you have these flimsy cookies that break as soon as you pick them up (oh yes, I’ve been there). So make sure you chill the dough at least 2 hours before baking. This means you better plan your baking accordingly. If you have a hankering for cookies right this second, sorry friend, but you will need to wait two more hours to eat some. Maybe you should try my melted chocolate chips and peanut butter trick in the mean time. Going along with number 1, if you chill the dough overnight or longer, let the cookies thaw at room temperature for 15 minutes before baking. This will give them some freedom to spread while cooking but not a lot. Otherwise, they will stay their same shape while baking (aka a medium-sized ball of dough). To get the cookies to cook evenly, you’ll need a cookie scoop. I recommend this one. It’s a lot easier than rolling the dough into balls. Plus, it will keep your hands clean. Hooray for cleanliness!! 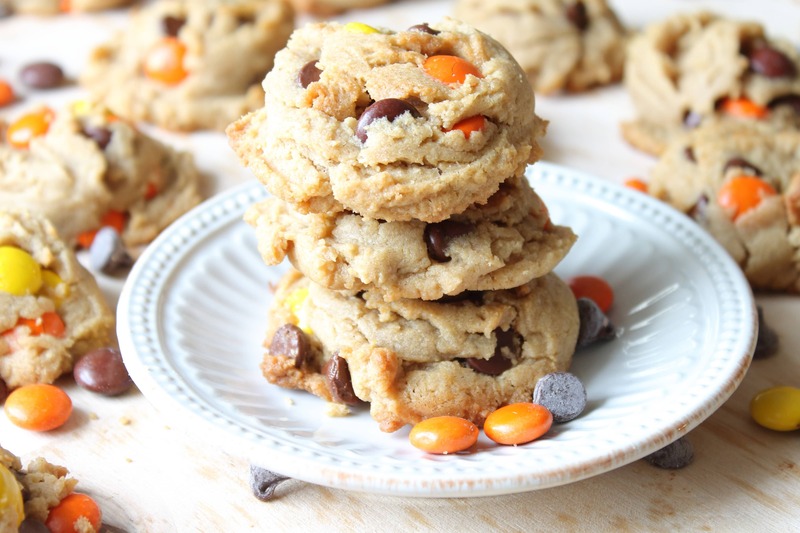 These cookies are a peanut butter lovers dream: soft, chewy peanut butter cookies, with Reese's Pieces and chocolate chips. Every bite will will feel like heaven in your mouth! Using a mixer, cream together the first 5 ingredients (through vanilla) on medium-high speed until light and fluffy, about 5 minutes, scrapping the sides of the bowl, as needed. Add the flour, baking soda, salt, and mix on low speed until just incorporated, about 1 minute; do not over mix. 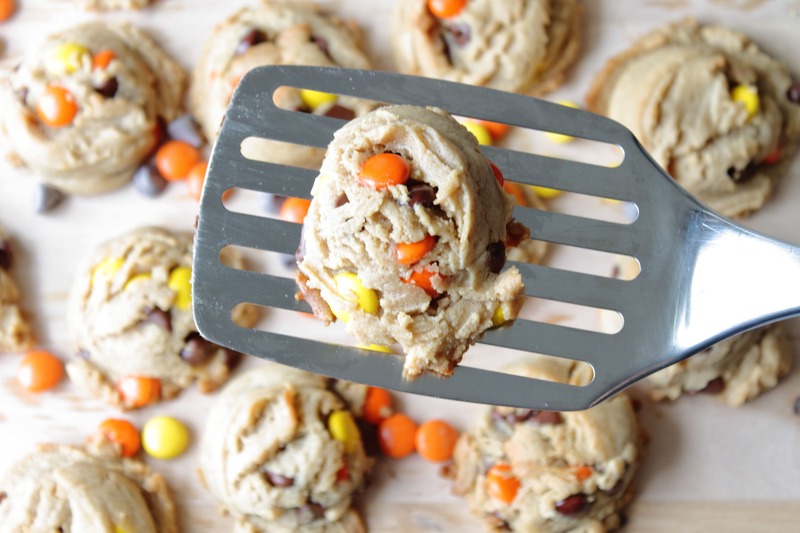 Using a spatula or wooden spoon, add the Reese's Pieces, chocolate chips, and blend until just incorporated. Once the dough is chilled, pre-heat oven to 350 degrees. Note: if you chilled your dough overnight or longer, you will need to remove the dough from the fridge while the oven preheats. See note above. Place dough on cookie sheets lined with parchment paper, about 2 inches apart from one another. Bake for 8 to 9 minutes, rotating cookies halfway through. Do not bake longer than 10 minutes, as they will firm up as they cool. Do the chips and Reece’s always fall out of the batter pretty easily? I found myself making cookie balls than rolling the balls in the Reece’s to get more into each cookie? Yeah I’d say that happens. The cookies are loaded with chips and candy so they tend to fall out. Is the vanilla measurement correct? One tablespoon? Or should It be one teaspoon? Thank you! Yup, it’s one tablespoon! Thanks for asking! Thanks for the quick answer! Last batch just went in the oven, and will soon be delivered fresh to my husbands CPA firm, to provide fuel for the final week push! Meanwhile, your trifle and chicken kabobs are on my list for Easter company! You are so welcome! I am so psyched that these cookies are going to fellow CPAs! I hope they enjoy them. Also, I’m eager to know how your Easter turns out so come back and let me know! If you have any questions on the kabobs or the trifle, just shoot me a comment or email. I’ll be around to help! Rave reviews from Greg’s office staff on the cookies! I am about to make them again to send to my twin daughters for the college finals care packages! The English Trifle was a hit for Easter Dessert. Unfortunately the chicken kabobs did not get made, but I have company coming next weekend and think they will be perfect for Friday night dinner. I am so glad I stumbled onto your site! Can’t wait to find my next recipes! Thanks. An dhope you are breathing a little easier now that 4/18 is past! I’m so happy to hear all the cookies and trifle were well received! Don’t worry – grilling season just begun so I’m sure you’ll have time to make the kabobs 🙂 Thanks so much for the awesome feedback and for your viewership. I am beyond overjoyed when hear from fans of CPA so you made my week! If there’s anything you particularly want to see on the blog, I love to hear suggestions so feel free to shoot me an email if anything comes to you! 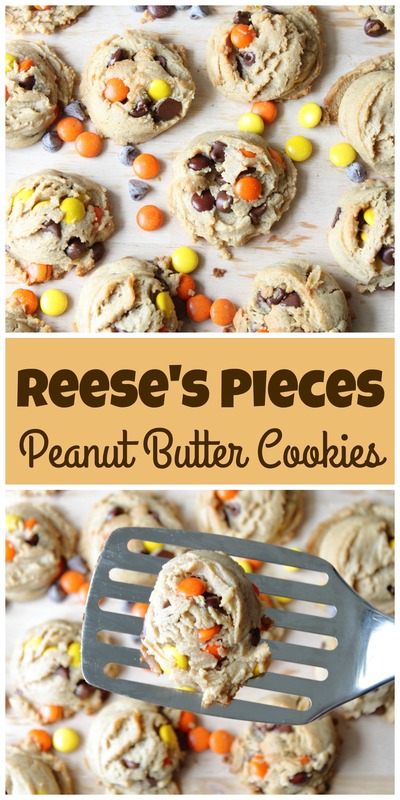 I love Reeses so this would be right up my alley! Me too! I don’t know why it took me so long to make these! Yum! 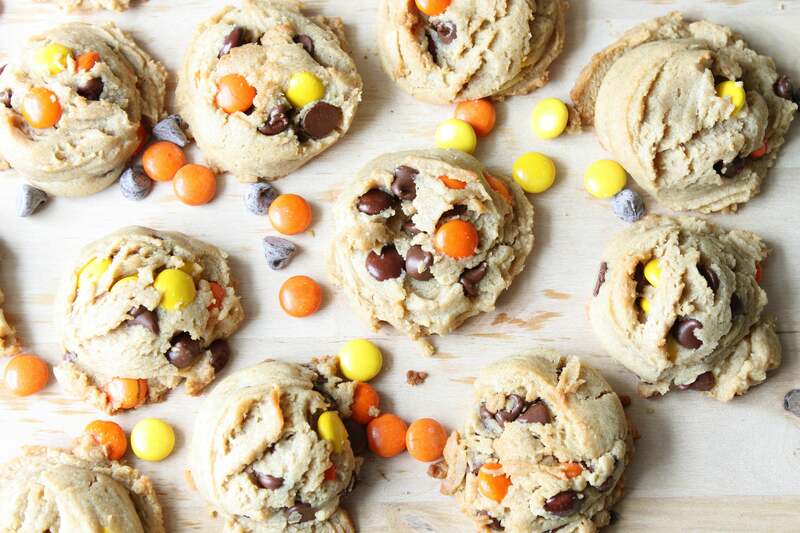 Some of my absolute favorites all in one cookie! Thanks! Can’t beat this combo, am I right?! Yeah Sarah! I thought of you when I was making them. Peanut butter lovers unite!